Oracle had acquired Sun Microsystems almost a decade ago. Continued investment had occurred in the Systems and Platform products. SPARC had moved to become the fastest processor on the market 2 years back, Solaris is now moving to agile Continuous Delivery Model to increase cadence, and the SPARC cadence will continue to maintain best-in-class performance. Four Take Away points were provided by Mr. Fowler. Before Oracle's acquisition of Sun, SPARC platform performance was lagging in the industry, but Oracle investment had brought it to the pinnacle of the market in a short number of years. 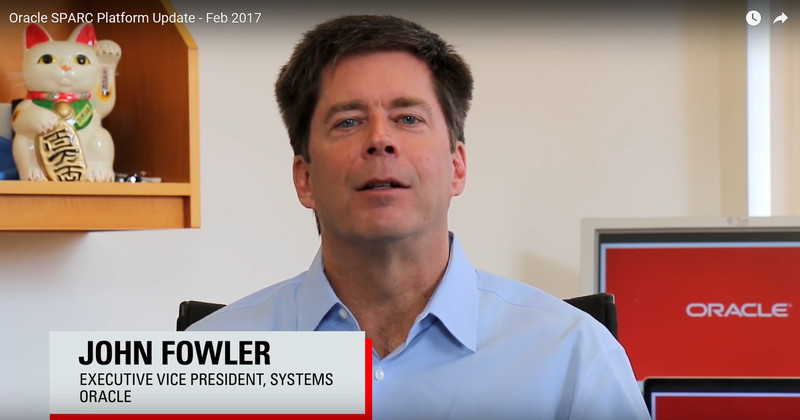 Oracle is the leading the market in Systems Performance, both in general purpose computing, as well as embedded accelerators to quicken performance of business critical and security applications. Oracle intends on keeping this performance lead. 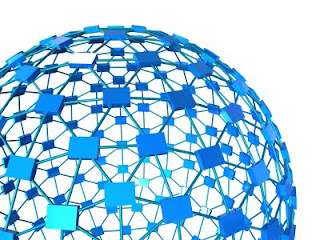 Solaris had traditionally been under a Waterfall type of Major Release Cycle. 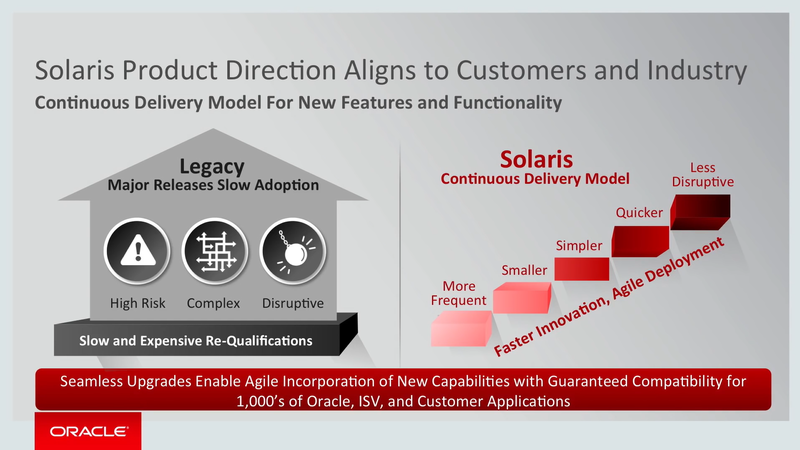 Solaris is being migrated to an Agile Continuous Improvement cycle, where features & benefits will be introduced continuously, without the risk of large monolithic release cycles. With the adoption of the new Agile Continuous Delivery model for Solaris, the roadmap changes, without much significance, except support continuing to later dates, decades from today. This overview was excellent, prepping customers before the on-site visits. 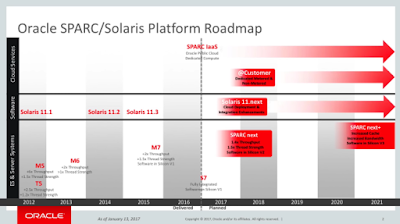 Not explicitly mentioned in the presentation, but Solaris 12 features will be folded into Solaris 11 updates. During an on-site meeting with an engineer, K-Splice should be coming to Solaris 11. This was a big feature expected in Solaris 12, so patching would no longer would require a reboot under Solaris. Oracle continues the decades long progression of Sun Microsystems managing the Educational Facilities, the Engineering Facilities, individual Enterprises, and ultimately The Internet. 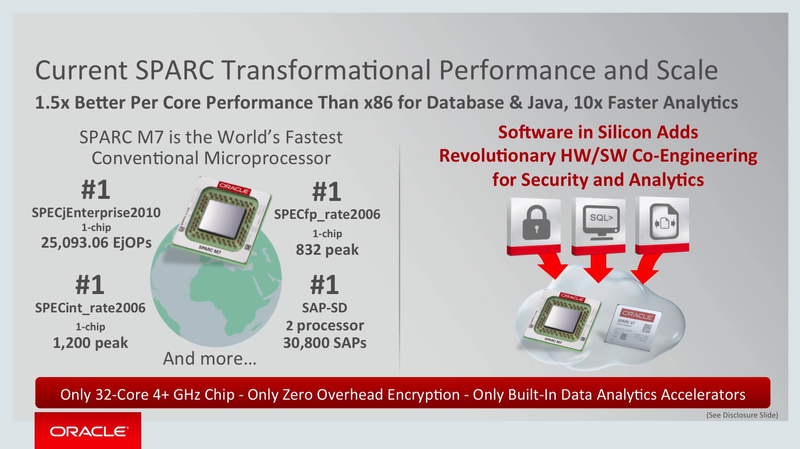 The cadence for processors had increased and now the cadence for Solaris features is poised to accelerate. 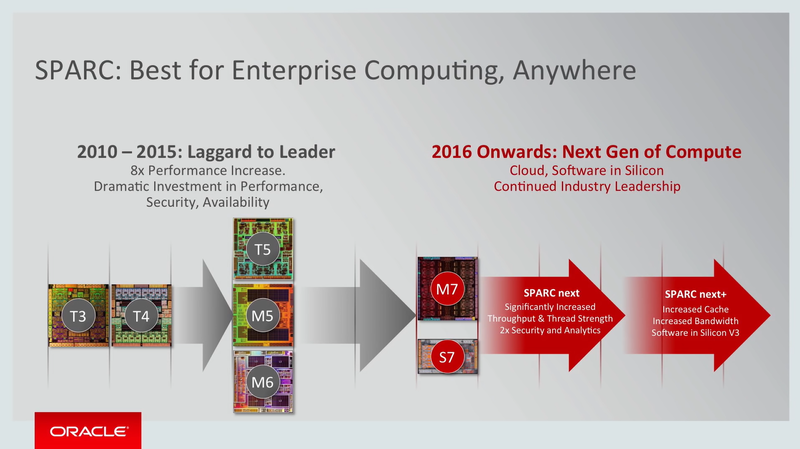 Oracle Linux on SPARC Arrives!